The Gulf Fritillary is as fascinating as it is amazing. 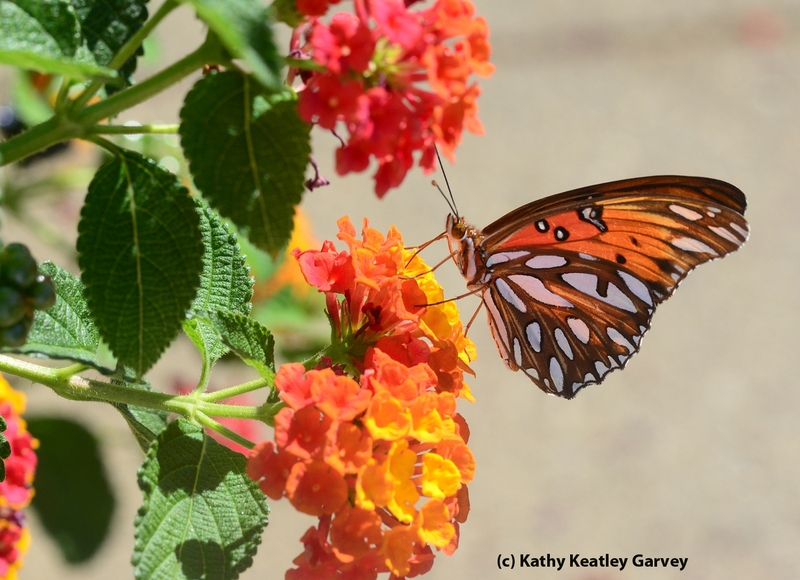 The showy reddish-orange butterfly (Agraulis vanillae) is making a comeback in the Sacramento-Davis area. In the early 1970s, it was considered extinct in that area. 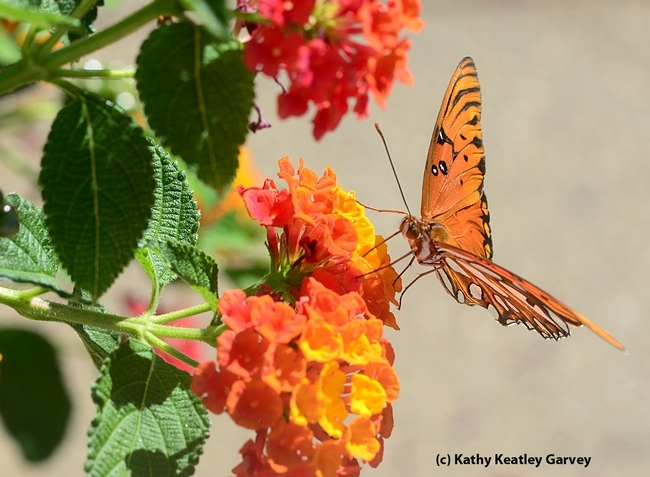 Shapiro describes the Gulf Fritillary as “one of the most widespread weedy butterflies in the Americas." However, he points out, it has no “native host plant in California." Those who want to attract the Gulf Frit can do so by planting its host plant, passion flower vine (tropical genus Passiflora). The butterflies lay their eggs on the plant and voila! Leaf-munching caterpillars. Shapiro points out that the Gulf Frit caterpillars "will not eat all of the Passiflora in cultivation in California." They can be particular. The Gulf Frit "has no diapause and is subject to killing out by hard freezes; in my experience, 22F is completely lethal to all stages," Shapiro says. "It has been bred for release at weddings, garden parties and the like, but there is no direct evidence linking its return in this region to such activities. If gardeners find it a pest on their Passifloras it is easily controlled by hand-picking or BT (Dipel), but it seems, to judge by my email, that most people are thrilled and delighted to have it in the garden." Shapiro and two co-authors recently published a paper in the Journal of Biogeography (J. Biogeog.39: 382-396, 2012) on the pylogeography (geography of molecular-genetic variation) of widespread Western Hemisphere human-associated butterflies. 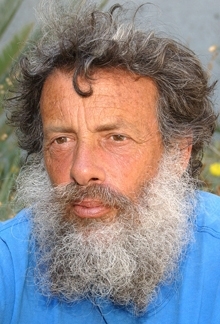 The reearch is the work of Erik Runquist, UC Davs Department of Evolution and Ecology; Matthew Forister of the Department of Biology, University of Nevada; and Shapiro. "We had suspected the Gulf Frit might be introduced in the United States but the genetics show not only that it is not, but that it is apparently two species--one entirely South American and one North American--but we have made no move to name anything!" It's interesting that another host specialist butterfly, Cacyreus marshallili, a native of South Africa, is becoming a pest of garden geraniums (Pelargonium) in Europe, where "there are no native Pelargoniums," Shapiro says. "The butterfly (known as the Geranium Bronze) is becoming a real threat to the tradition of having geraniums in window boxes. Some European butterfly folks like its presence--unless they grow geraniums." Nice! Glad to hear you have these little visitors! I have at least 20 caterpillars of this butterfly on my Passion flower vine on my back yard right now!, I live in Roseville, California, I'm just amaze to see the orange butterflies dancing on my back yard! I'm loving it! Hi Kathy I love your blog! I was very excited to have been gifted a "found" dead Gulf Frit for my bug collection by Ellen Z.
I am so glad to know what has been bringing smiles in our backyard! We live in Rancho Cordova and have had passion flower vines for the past 7 years and have spotted one or two butterflies a year in the yard. In the past two weeks we suddenly have dozens and dozens of chrysalis' ! I thought they were viceroy but that just wasn't matching the description. I'm not sure what their odds of survival are but I have picked up about 15 off the ground who were never able to fly. I tried giving them some sugar water on a q-tip and about 4 regained strength and were able to fly away but the others have died. Do you have any tips on helping our friends? What is their expected life time as a butterfly? Hi, Kirsten. Thank you for your email. 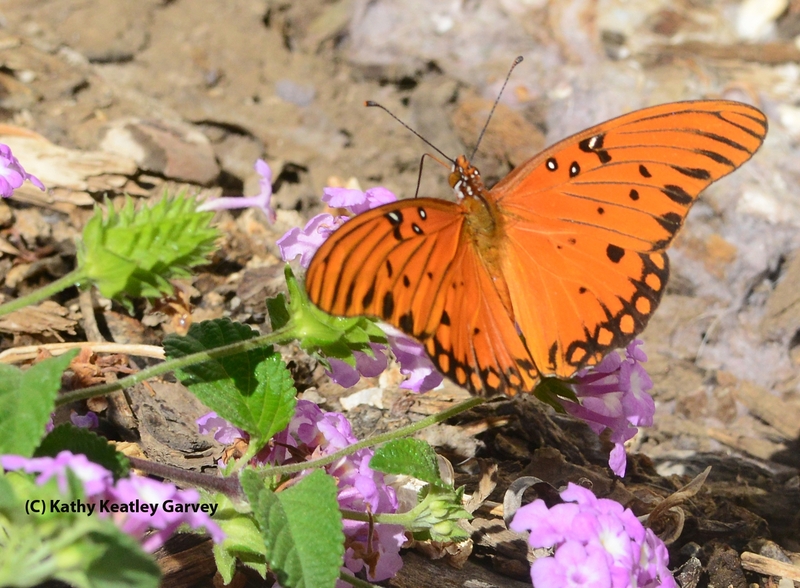 We consulted butterfly expert Art Shapiro, distinguished professor of evolution and ecology, UC Davis, for his response: "First off, Viceroys aren't found anywhere in CA except down in the extreme SE corner, in desert-wash riparian habitat. Adult Gulf Frits, which are pretty unpalatable to predators (they have chemical defenses), are quite long-lived. In warm weather they can live 4-6 weeks. In cold weather they can live 2-3 months, but are killed outright at 21-22F. For the record, butterflies have sugar receptors on their feet. When the feet contact sugar, the proboscis uncoils automatically for feeding. If it's necessary to feed a butterfly, place watered-down honey--not much--or Pepsi or Coke right out of the container--on a fairly non-absorbent surface (I use a strip of foam rubber) and, using forceps to hold the wings over the back, lower the feet to the liquid. Bingo! Allow to feed ad lib." Will my passaflora survive all these gulf frits in the making. Anything I can do to help it along to continue providing for them? I have the Maypop and Purple Passionvine, which is working well as a host plant for the Gulf Frit. I recently bought a Red Passionvine and then read it is poisonous to the Gulf Frit. Is it true.